A full record of changes to the colony over the years. 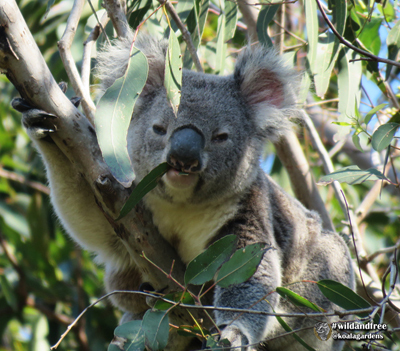 Data is collected daily on the property by physically going out and looking for the koalas, photographing each animal, and then recording information into a database. The collection officially started on January 1, 2015. There is now four full years of data to analyse. 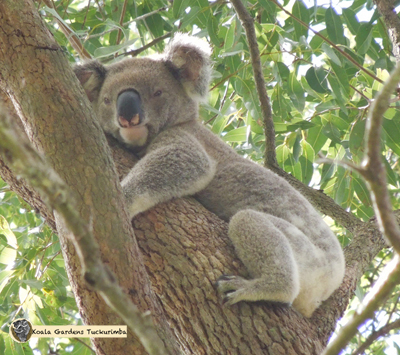 The major categories of figures are: number of days koalas are sighted, the number of sightings on any particular day and the number of individual adult koalas and any back young that may be with females. 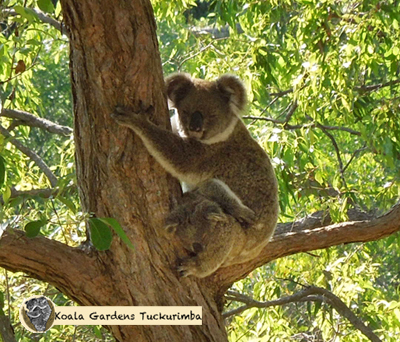 Koala Gardens is situated in a natural koala corridor and this means that it is normal for a number of koalas to travel through the property. 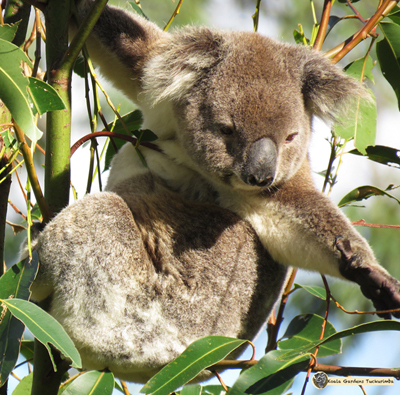 In each year below, koalas will be listed in order by the largest number of days on the property through to the least. The only change I made to data collection this year was to mark the food tree plantation as 2 sections because it has started attracting koala attention. 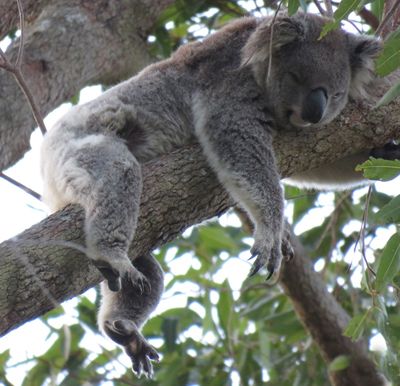 Now that I have 2 full years of data on koalas in locations I can begin to analyse this. Without a doubt 2018 has been a year of constantly exceeding expectations and proves that the answer is one simple word - HABITAT. 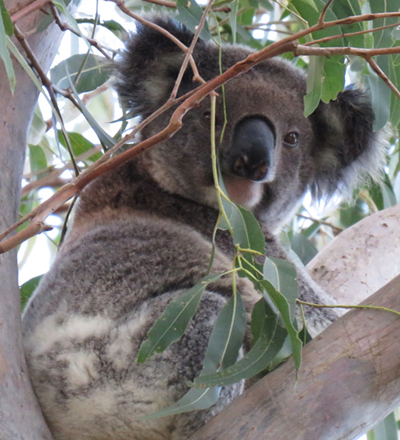 The final figures for 2018 saw koalas being found on the property a total of 355 days. 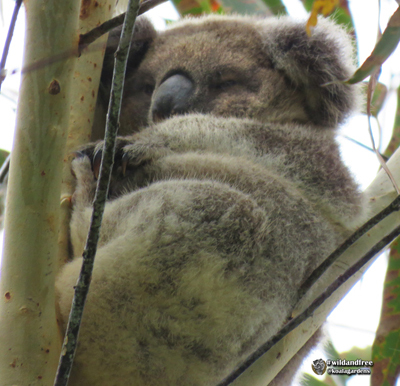 This seems like koalas were found 2 days less than in 2017 BUT the huge difference is that the only 10 days all year that no koalas were spotted on the property were the only 10 days all year that I was not present on the property. 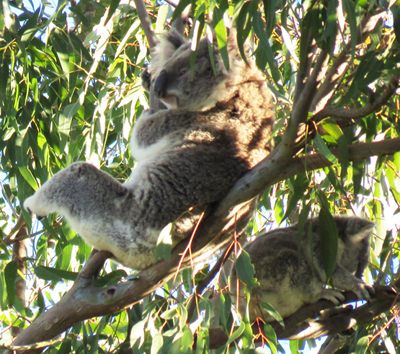 I was never gone for more than 3 consecutive days so it is fair to say there were in fact koalas on the property every single day in 2018. 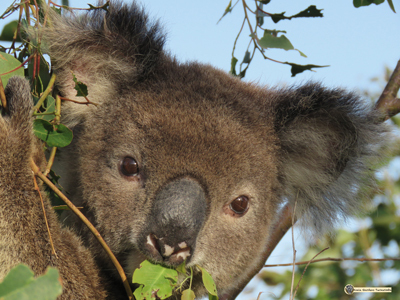 This is huge when compared to 4 years previously when koalas were only found on 228 days out of the 365. Over those days there were a total of 1372 adult sightings and 277 back young. This shows a continuing upwards trend and an average of nearly 4 koalas every single day. 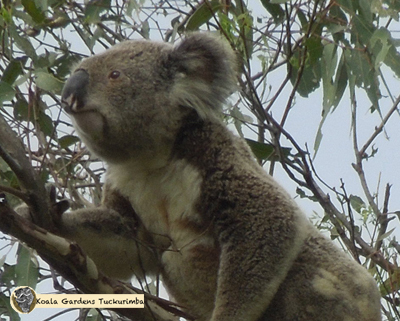 In fact the largest number of independent koalas seen on a single day was 9 (and there was 1 back young as well). 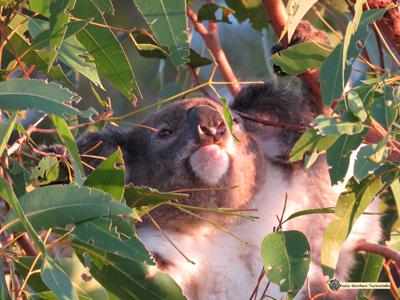 These days of sightings were the result of activity on the property by 30 individual adult/independent koalas. Adding to these astounding figures is that the 4 regular resident adult females produced joeys, and all 4 joeys have become independent from their mothers ON the property. This has never happened before. 2017 we saw 2 of 4 joeys raised on the property remain, at least for a while. Greta produced another joey which she brought onto the property once. Tragically the colony matriarch Mist was taken by chlamydia at the age of 12 which is an awesome age to reach. Her son Krissy was able to be successfully treated for the infection and released back home. 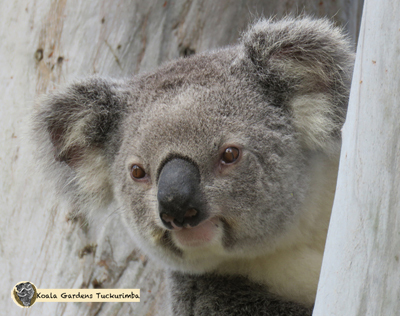 One other koala, Janis, walked onto the property with Chlamydia eariler in the year and was immediately captured. There was NO other sign of ill health on the property all year. managed to hold his own winning a place in the colony. He spent 2 months fighting for his life at Currumbin Wildlife Hospital and finally was healed enough to be released back onto the property. was such a close second being here 215 days of the year. The 'Divine Miss M' has kept her title of Princess and produced another female joey (very probably fathered again by Legion) named Dewdrop. But her favourite area has always remained in the cool sheltered bloodwood gully area named on the map as Maxine's hangout. She is incredibly photogenic, and has taken to motherhood as though it were the most natural thing in the world - oh hang on, it is! was not far behind, spending 181 days here. Mist made 12 years of wild koala life count indeed. Mist was a very important matriarch of the colony and has produced at least 6 known offspring (but very likely produced more). She was taken, as are so many koalas, by chlamydia in December and will be sorely missed, but she will continue to do so much for koalas. She is the main character in a childrens book that has been successfully released in 2018 and is the first of a series. So Mist will live on for many a year to come yet. 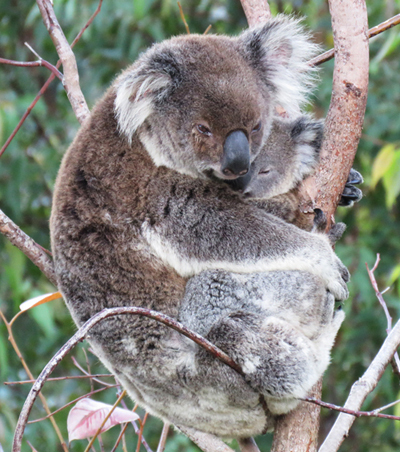 has matured into the most beautiful big koala during this year and successfully raised her first joey - Frankie. She is a little younger than Racee and Maxine and so got to enjoy 2017 as a teenager, but she really came into her own this year. It was thought Bullet had mated her, but Frankie bears many signs of being a son of Jordan, mostly in his round face and dark colouring. She was found on the property a total of 178 days - just one more day than she spent here last year! was seen on the property a total of 103 days. She is the first daughter of Maxine and they separated gradually over a period of weeks and then shared the area around Jordan's red gums and bloodwood gully. As the winter progressed and Maxine showed a lot of pouch bulge with a new joey, Stella slowly spent more and more time away from the property. It is certainly hoped that she has found her own home range nearby and is doing well and I keep my eye on nose patterns looking for her. was seen on the property a total of 81 days, only 7 days less than in 2017. He seemed to be developing a pattern of leaving the property for the Autumn and Winter, returning late spring or early summer for the breeding season and staying as close as possible to Maxine. However, he has not returned during this summer breeding season. He has not been seen even once. Instead, Bullet has been frequenting the same area and following Maxine. It is hoped that Legion has made a permanent home range nearby. remains the alpha male of the colony. This does not mean he is the only male, but he is the top fella on the pile and I think he moves over a large area. He has matured on even more this year and his scent gland increased with the new breeding season, demonstrating his high status to all. He was seen on the property only 72 times, howeve this is 22 times more than last year so he has been quite active. Jordan has still been observed to often move quite large distances during the daytime, so it is possible I still often miss him as he moves through. was the third young female that arrived late 2016. She has produced her second joey this year - Phoenix. We are still unsure if this is a male or female. 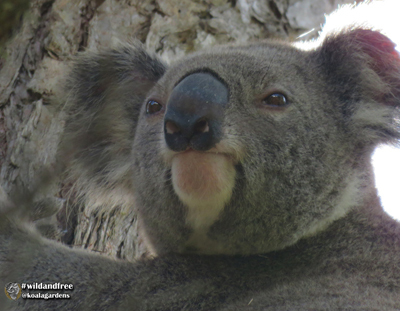 Racee only ever uses zone 9 and 15, the top western zone of the property, so most of her home range is not at Koala Gardens. She was found on the property a total of 71 days, which is roughly half the amount of time she spent here last year. is the son of Mist. He spent his young days in the area that has now been renamed Frankie's playground, but it was certainly Enigma's playground originally. 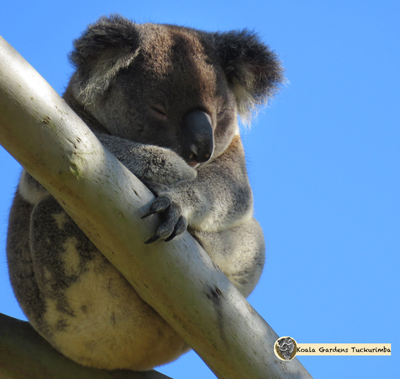 Enigma is the first joey conceived, born and emerged from the pouch, that remained on the property. However, as he began to mature a little, and males were beginning to feel the breeding season would start, he was probably pressured to move on. After he left, he has occasionally been seen on the property a day here or there, so it is thought that he has made a home range quite close by. has only spent 53 days on the property, but that has only been over the last 4 months of the year. He has spent a lot of that time sticking as close as possible to Stevie. He is a dark colour, so if the new joey is dark it will be hard to know if Jordan succeded again or if Beau was the lucky one! He is a large fella and it is going to be interesting to see if he becomes a full colony member. was probably born around Nov/Dec 2017 and showed as a definite pouch bulge in Stevie in early Feb 2018. 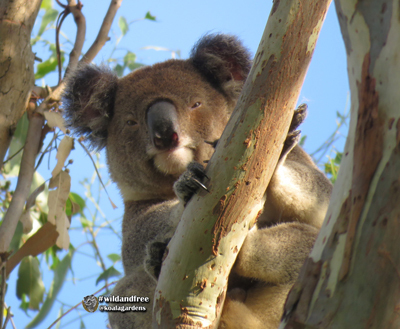 He emerged from the pouch in July and for a long time was hard to see closly as Stevie tends to stay very high in the treetops. Finally at the end of November he separated from his mum and spends most of his time in Frankie's playground (where Enigma grew up). He is as comfortable in very high mature trees as in the younger plantation area. If Stevie comes through he seems to try and follow her, but she is too smart for him and he is usually left behind. He has been seen alone 26 times. is the last son of Mist. He was born around Nov/Dec 2017 and emerged from her pouch in late June. For a long time we all thought he was the prettiest female joey we had seen and it was with hilarious surprise that it was discovered, just after he separated from Mist that he is indeed 'he'. They separated in late October and all seemed well, but suddenly Krissy developed conjunctivitis fast. He was captured and taken into care and treated for a positive chlamydia infection. 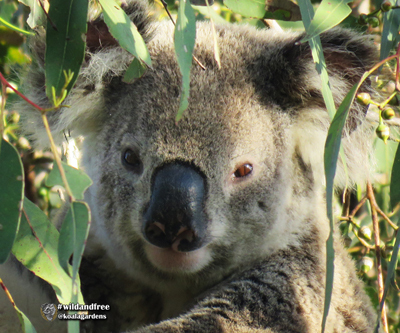 He responded quickly to the treatment and just 5 weeks later was able to leave Friends of the Koala and be released here again where he is settled and growing now. He has spent 23 days independently on the property now. was only seen here 14 times, but that was over a 4 month period from May to August. So he was seriously looking for somewhere to call home it would seem. He is a big boy, and seemed fully mature. 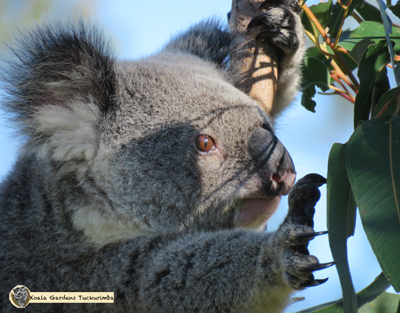 With all that is happening with koala habitat destruction it is hard to know why an individual moves through. 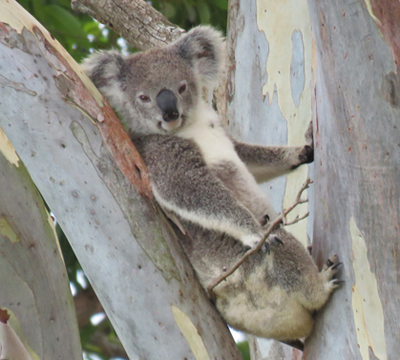 What we do know is that there were more koalas on the move throughout the north coast this year. 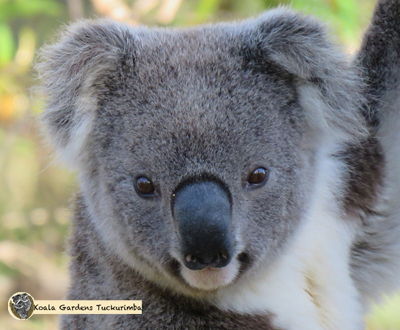 Koala Gardens statistics certainly supports this and reflects the general trends being cited by the expert researchers. Hopefully he found somewhere safe to settle. was also seen here only 14 times, and over a 4 month period but from July to October. He was another large, mature looking male that seemed to be searching for a home range to settle in. He was not seen fighting with any other males, but he must have been moved along it seems. I hope he found a safe home. is a delightful female, probably younger as she looked around 4-5 kg. She was on the property 11 times over a 4 month period from July to November, but these did not really coincide with Tucker or Winter. We all hoped she would stay, but hopefully she has found a safe place to create a home range nearby. is the joey of Maxine and I am pretty certain this is another female. 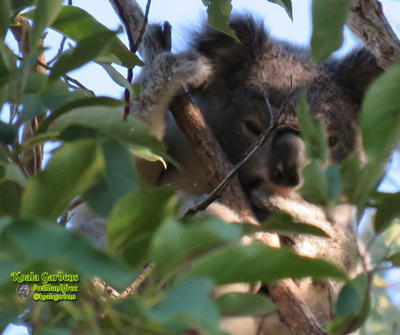 Dewdrop was born around Dec 2017/Jan 2018 and emerged from the pouch in early August. She separated from Maxine in mid December and Bullet has been sticking close to her nearly every day, often in the same tree. This is not 'protective behaviour' from the view of him wanting to look after her, he is hoping she will be a breeding candidate but he is a full year too early. His attention to her has made it pretty certain she is female as he would ignore a 2 kg male joey. She has been seen independently of Maxine on 10 days. was seen a total of 5 days, almost consecutively. During that time he spent a day each in a different area of the property and then was gone. It is hoped he found a home range to settle in. was seen a total of 5 consecutive days. She was always up around Racee's highpoint. It is not known if she was looking for a place to make a home range, or if she is a local koala that had come across the boundary. Hopefully she has a good home range now with plenty of food. was a lovely girl that popped in for 5 days during winter. 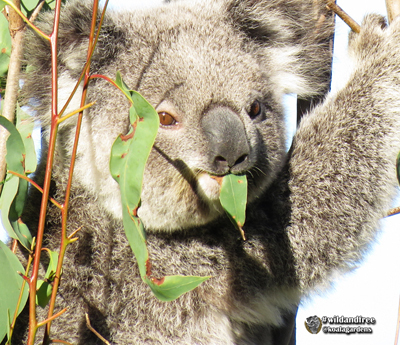 Often koalas are moving around at this time of year because feed is low and the need for calories is high. Hopefully she found somewhere to make her own home range. was only seen 4 times on the property. Oddly she was here 2 days in a row in September, then again 2 days in November. She was given this fab name because she was incredibly difficult to get an identifying photograph/video of, due to being intensely shy. only spent 3 days on the property. 2 days in late November, and then again late December. She must be related to Shyla, because she was also intensely shy and it took a lot of effort to identify her. Her apt name is for her shrinking violet nature. was here just 2 days. A lovely and definitive nose pattern and then he was gone. It seems he was a younger male, probably only barely 5kg in size. I hope he found a safe home range to settle in. was here for only 2 days. Really she arrived one afternoon, and the next morning I captured her. She had advanced chlamydia both in her eyes and bladder which was very sad. She was taken to a vet immediately and the systemic damage was confirmed. She was euthanased kindly and I hope she hadn't suffered too much too long before she came here. was here just one day in November. I guess he was travelling the natural koala corridor looking for a place of his own. Hopefully he found somewhere safe with lots of food. was here just one day in October. 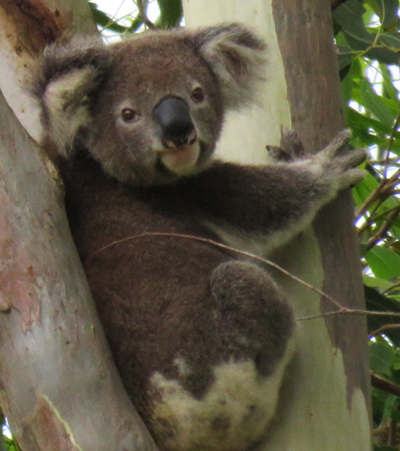 Hopefully he safely found his way along the natural koala corridor and was able to find a place to settle and live safely. was here just one day during May. I hope he found his way to somewhere safe to live a long, healthy koala life. was seen here a lot in 2016. She had a weeping eye and was captured and we attempted to treat it but is seems it is a tear duct malfunction, rather than infection. May you live well Greta, what a marvel. is the first joey of Racee. They separated and she became independent in late November 2017. Racee took her away from Koala Gardens and left her. One day in late April, Karla was seen up in Racee's highpoint area. She had grown by at least 1-2 kg, and was looking terrific. Hopefully she has found a good home range, with great food trees and will be healthy and ready to breed for 2019.
is the second joey of Racee. She was born during December 2017. 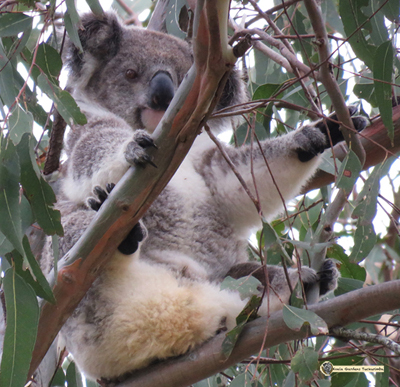 She emerged from the pouch in early August and grew quickly. We are still unsure if Phoenix is a male or female. Phoenix and Racee separated on Dec 31, 2018 so there has been just one day recorded of Phoenix as an independent. Hopefully she will stay around for a long time - she certainly has her mothers eyes. was here just one very wet day in March. We hope she found a safe place to live with lots of food trees. I again added a slight change to my data collection as I felt that it was really time to pin point where the koalas were on the property. In fact, each new piece of data, while valuable beyond doubt, increases the amount of time and effort I spend each day. As I looked over 2 complete years of data however, the value of documenting this (which I already knew to a large degree in my head) had become crystal clear. 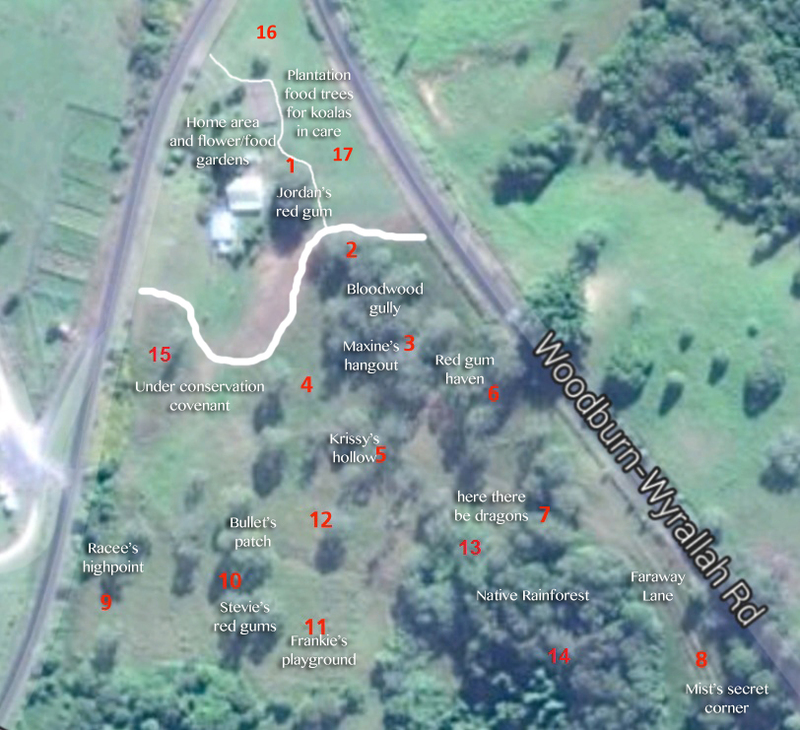 I divided the property into 15 zones which are numbered and that is recorded in the database. 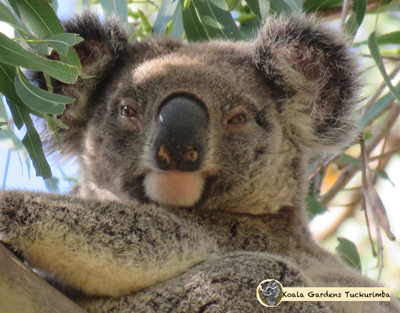 However, I have also named many areas around those zones according to the habits of the regular koalas that were here for this year. 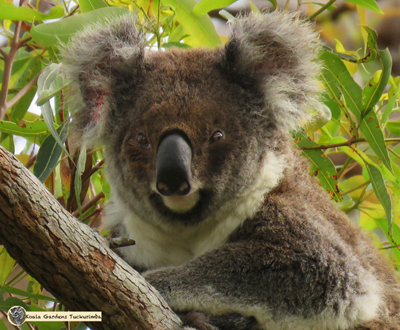 There are many overlaps, and each koala named does not only use that one spot, but it gives an idea of the distribution of them across the property. I will talk a little more to their movement on the property below when I discuss each koala. 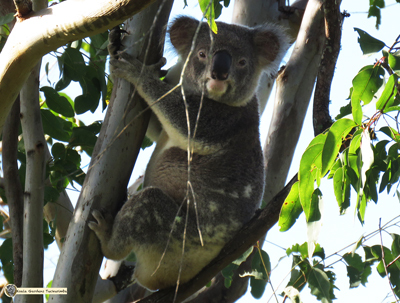 The final figures for 2017 saw koalas being found on the property a total of 357 days. This meant there were koalas spotted 5 more days of the year than previously. 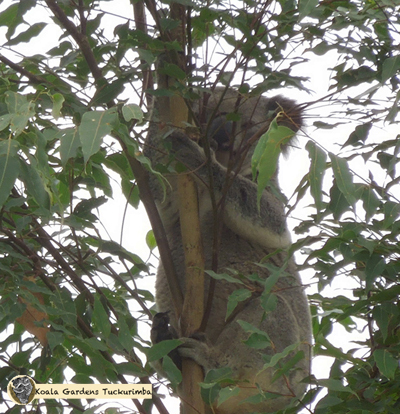 There were 5 days that the property was checked and no koalas found, and 3 days when the property was not checked. 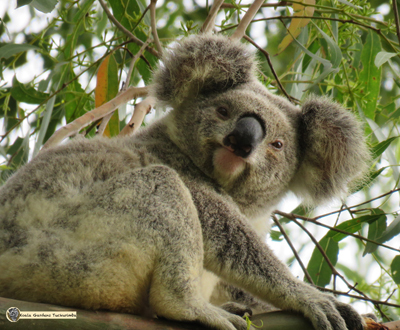 This is mind blowing when you consider that only 2 years previously there were no koalas seen on 137 days - ponder that a moment. and there were zero back young seen in 2016 so this increase is huge. 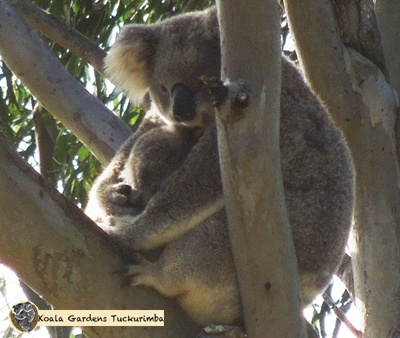 These days of sightings were the result of activity on the property by 21 individual adult koalas. was seen on the property a whopping 233 days of the year. needs changed when nursing Stella. But her favourite area has always been in the cool sheltered bloodwood area, which morphs into my favourite patch of self sown red gums. important influence on the genetics of the colony here. has matured into the most beautiful big koala during this year. When she arrived she was a sub-adult, weighing around 3kg and it was the end of 2016 and mid breeding season. 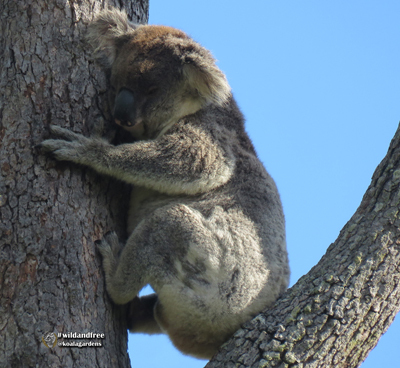 She was not mated and so got to spend her teenage year feeding well on the many trees available at Koala Gardens and nearby as she was not on the property every day. But the growth in her in the second half of 2017 was amazing to see as she matured out. The photo here shows this clearly. She was mated by Bullet mid October, and so the waiting game to see the next generation joey emerge begins. She was found on the property a total of 177 days, so nearly a full half of the year. 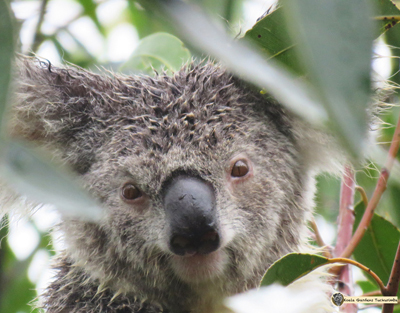 Her ears continue to delight everyone as they are surely the biggest koala ears in the entire world. was the third young female that arrived late 2016. It is most likely that she mated with Zorro to produce her female joey Karla this year. This was her first joey ever. 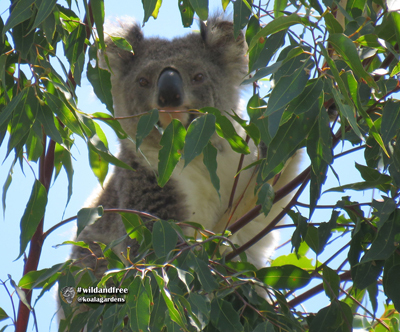 Racee only ever uses zone 9, the top western zone of the property, so most of her home range is not at Koala Gardens. She was found on the property a total of 146 days, so around 40% of the year. She was often seen hiding out in dense shrubs on the western boundary and I suspect I missed her a lot of days. She is a good dark colour with a lot of nose pigmentation. At the time of mating it appeared that the father of her joey would be Zorro, but as Enigma grew on as an independant sub-adult it is more likely he was sired by Jordan. This guesstimate is based on his dark colouring. Mist left the property with Enigma on her back at the end of May, and she reappared mid September and deposited him in the area on the map called Enigma's playground. From mid September to the end of the year, he was seen here 92 days - I presume any day I did not find him in this time was because I missed him, as he stayed in zone 9, 10 and 11. 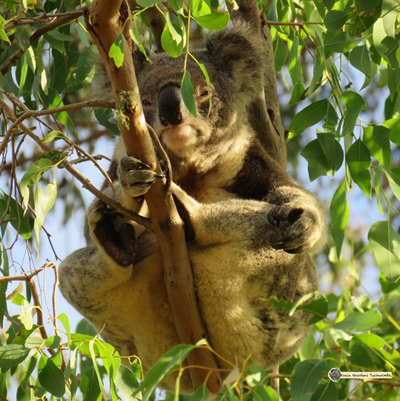 Enigma is the first joey conceived, born and emerged from the pouch, that has remained on the property. He received his name as it took nearly a week of daily sighting and photographing him to be sure if he was male or female. was seen on the property a total of 88 days. Legion may be developing a pattern of spending time here during only some months of the year. This is the kind of data these daily recordings will reveal over a range of years. Legion mated with Maxine and the resulting female joey was Stella. Maxine was young at the time of mating, and I suspect that older males like Jordan and Zorro may have considered her too young and left her alone. Legion was really only a teenager himself, and I think a mature and experienced female would have told him to back off. It is thought that Legion is a son of, or closely related to Jordan because of his facial shape and colouring. 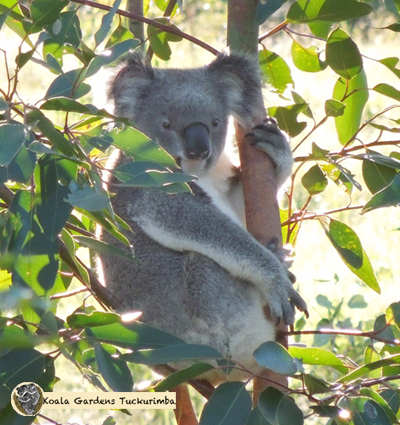 arrived at Koala Gardens early August 2017. He appeared to be a young adult, maybe 2 - 3 years old. This was determined by a number of observations - his size, his head shape, his scent gland and his behaviour. He was found here 68 days during this time and it appeared that he was coming and going a lot, possibly looking for somewhere to settle in and call home. 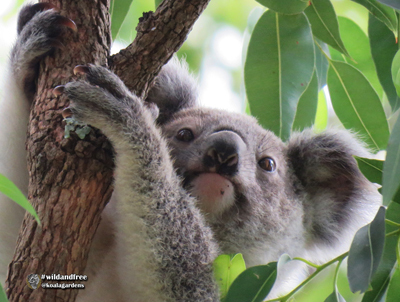 Within a short time another young adult, Takeshi, arrived and over the next month there were several altercations between these 2 koalas, so a desire for settling on a home range became obvious. The main area these 2 fellas were inhabiting was the home range area of Zorro at the time. See Zorro for more on him. Bullet often seemed to be the loser when watching altercations, however, in fact he stayed and mated Stevie, and Takeshi moved on. was only seen on the property 68 days during this year. 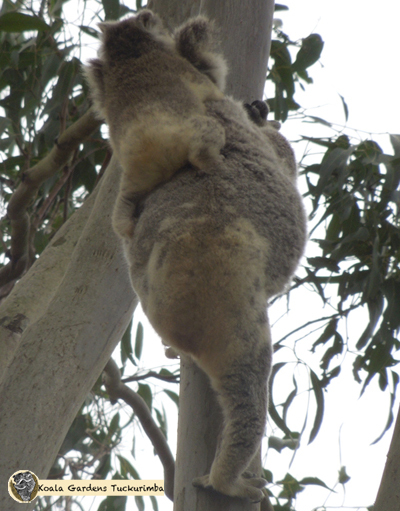 It is suspected that one reason she was here less was that there were 3 young females, 2 of whom had joeys in pouch. Territorial behaviour in females does occur, but it is very different to the behaviour of males. If there is enough food, older females will often make room for younger females. Another reason is likely that she brought Enigma back and left him here to become independent and so she stayed away more than usual to allow him to develop the skills he needed to without her around. Mist is a very important matriarch of the colony and has produced at least 5 offspring to date. She is going to be the main character in a childrens book due for release in 2018.
is the alpha male of the colony. This does not mean he is the only male, but he is the top fella on the pile and I think he moves over a large area. He was seen on the property only 50 times. Now there is something interesting to note about Jordan when considering these counts. He moves around more quickly than any of the other regular colony members. There have been many times when I have seen once in the day but he is gone hours later. This means it is very possible that he is on the property more often than I am able to verify, but moving more. He will use any part of the property at all, but some patterns of when he is around are possibly emerging from the data. It would be so interesting to know how far he travels within his home range. an alpha male who ruled over 10% of the property. Zorro was a mature alpha when he was first identified in March 2015, so it can safely be presumed he was breeding with females in this colony already by this time. Even though Zorro only used a small section of the property, he managed to father joey's in 2017 with Racee and possibly Greta. This means that Zorro was a very important part of the colony as he contributed important genetic material. Zorro was identified on the property 49 times from January until September 2017. Zorro was last seen healthy and strong on the property in Sepember 2017 - it is not known whether he has changed his home range or has met with misadventure. His last times seen here was when Bullet and Takeshi were both seen frequently in territory disputes over the are Zorro normally ruled. Enjoy a visual history of Zorro through the photo gallery. was just looking like she might settle here, but after 24 days she moved off somewhere else. The first week she was here, she moved up and down the property almost zig-zagging. Then she settled into the big red gums beside the house for 18 days and just when it seemed she was here to stay, she was gone again. We hope she found a home with a good food supply to live a long life as she was a big, healthy girl. was only seen here 13 times. He spent a lot of that time having altercations with Bullet and possibly with Zorro as he tried to claim a place in the colony. 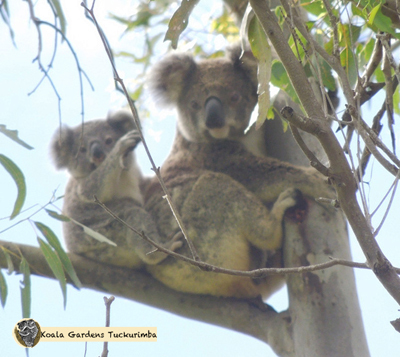 The video here shows how koala males fight and it is a dangerous thing as they are a long way from the ground, so in fact being flung from the branch is the greatest threat. Those teeth and claws are sharp, but their fur is thick. Bullet takes a smart strategy of moving out on the limb and in fact he is the winner in the long run, even if this looks like Takeshi is winning. is a beautiful dark coloured female who spent 11 days on the property. Most of that time was spent in a single tree. She was large and healthy. She was originally named Gizmo, but when it was confirmed she was female her name was altered. We hope she went on to find a good home range to live in. 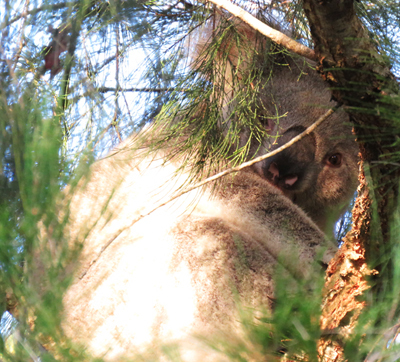 was the biggest surprise koala on the property so far. 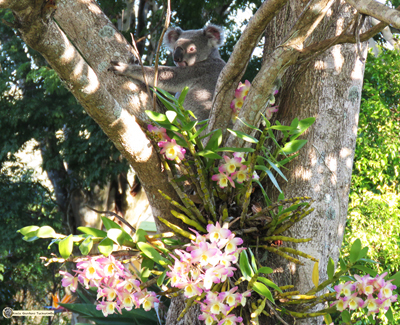 I was walking along with a wheelbarrow of mulch, in the garden area when I heard a noise and turned to find a koala - in an African Tulip tree, surrounded by Mexican Agavae, and sitting amongst beautiful Orchids. Hence she received her name. She spent 8 days on the property (but in gum trees) and we hope she found a home to live long, wild and free. 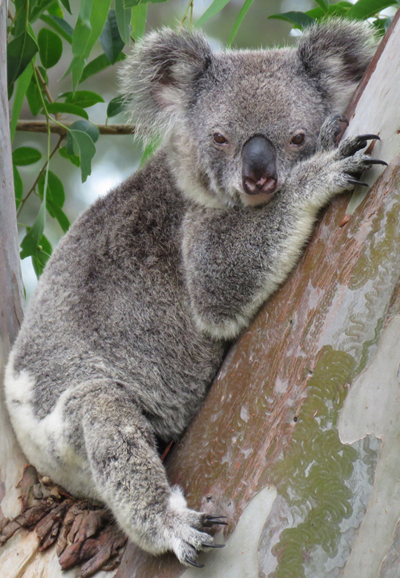 One day she was in Mist's secret corner, she is 1 of only 2 other koalas that have ever been seen there. seems to have moved her home range a little since 2016 and was only seen on 7 days of the whole year. Fortunately she had a big healthy joey with her on several of those days, so we could see that she is thriving. Her eye still weeps, but she is big, strong and breeding so we can feel quite satisfied that it is indeed just a tear duct issue. He was a sub-adult at the time and was likely looking for a place to name his own home range. Many seeing him felt he had a strong resemblance to Maxine, and he may well have been related to her. We hope he found a safe place to live a good long life. was only seen on the property 3 days during early August. 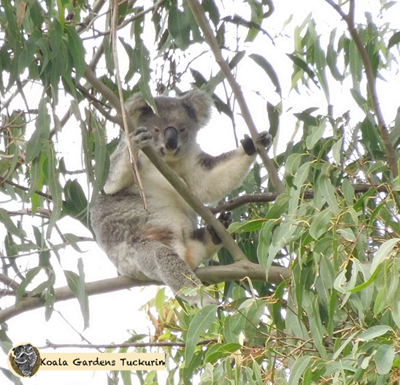 As Koala Gardens is positioned inside a natural koala corridor it is expected that each year a number of animals will move through for various reasons - mostly in search of a place to make a home range and a colony to fit into. We hope he found the right place to live in safety. arrived one afternoon as a summer thunder storm was brewing and this is the first photo I got of him. A delightful looking young adult. He stayed one more day and that was the last we have seen of him. Hopefully he found a safe place to make his home. was a surprise to find in a casuarina tree. 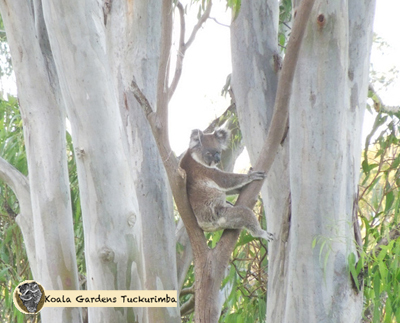 Although they are classed as a secondary food tree, I rarely see koalas in the few of these that are on the property. It always pays to check every tree. He was only seen here on 2 days, so we hope he found a safe place to call home. was only ever seen once and the photographic quality is poor. It was certain without a perfect photo that this was a new koala because all other koalas that were close to the size of this one had already been identified that particular day. Anchor was down in Mist's secret corner and is one of only 2 other koalas besides Mist I have ever seen down there. Hopefully Anchor found a safe home. was only seen once at Koala Gardens in 2017. This sighting however was significant and exciting. Cyrano was seen here 17 times during 2016. It can now be presumed (though it is not fact, but a good guess) that he made a home range fairly close by. When he was seen this one time, he was in a very strange position. 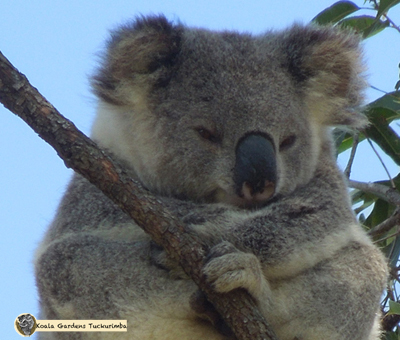 I woke at 4am to the sound of a koala screaming. When the sun came up and I went looking, I found Cyrano in a Leopard tree (NOT a native) and Jordan in the same tree. So it would seem that some boundaries had been breached, and a lesson as being taught. Wouldn't we love to know the full details of who, what, where and when? only spent one day at Koala Gardens. She had a large, healthy joey with her. It is presumed that she was possibly looking for somewhere to leave her joey to become independent. This presumption is made mostly by the size of the back young and how independent the behaviour was on that one day. 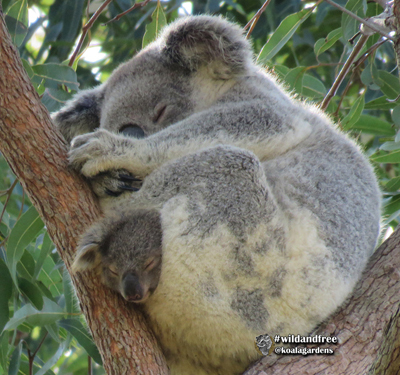 A perfect name for a mother koala with the next generation in this world where habitat is being destroyed at such a rate. We hope indeed that her joey found a safe home. 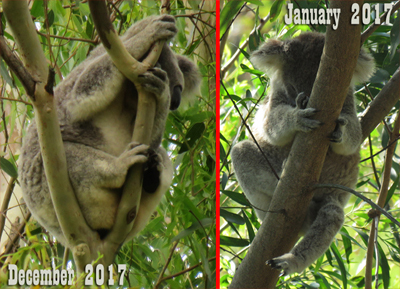 I headed into 2016 with a slight revision to my data collection as I realised towards the end of 2015 that I needed a way to differentiate between days that I went out spotting and found no koalas, and days when I was unable to go out spotting at all (eg if I went away for a few days). 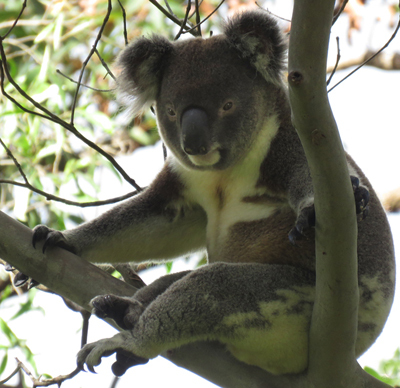 There is quite a statistical difference between recording that no koalas were located, and that the property was not checked. This is not only important for the number of sightings, but particularly important for identifying possible trends of either higher or lower activity. 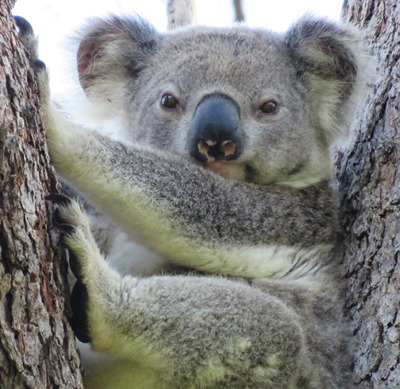 The final figures for 2016 saw koalas being found on the property a total of 301 days. This meant there were koalas spotted 73 more days of the year than previously. 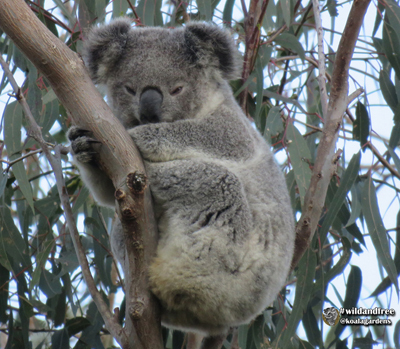 There were 53 days that the property was checked and no koalas found, and 9 days when the property was not checked. 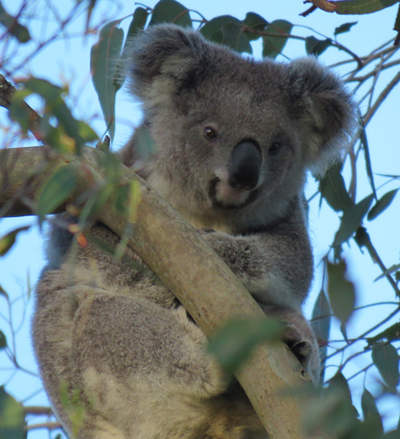 These days of sightings were the result of activity on the property by 16 individual adult koalas. a whopping year for our colony matriarch with her being on the property for 129 days which is just over one day in every three. Mist seemed to be developing a pouch but it was not verified no matter how many photos I took. Just when it seemed that her pouch would not be able to be hidden any longer she disappeared from the property. When she returned only a couple of months later she did not have a joey with her. There is no way to know if she simply did not have a joey this year, or there was some misadventure. 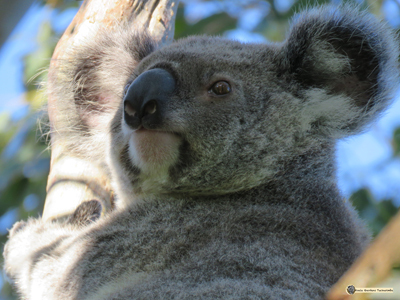 Female koalas do not produce a joey every single year, so it may have simply been her year off to gain good condition for the next joey. on the first day of March this young fella wandered on to the property and no one would have guessed at the time that he would become such an important part of the colony! The response to name him on Facebook once we could see he was definitely a male, was overwhelming. There were so many names put forward in a very short time, that I threw my hands up and named him Legion for there were so many suitable names! During 2016 he delighted us with his photogenic qualities many times during the 80 days he was spotted on the property. This was the very first photo I ever took of him and is a typical 'Legion' shot. has quickly been nicknamed "The Divine Miss M" and "Princess" because she seems to be about as perfectly pretty as it is possible for a koala to be. She arrived late in the year - November 5 was her first day here and yet she was seen here on 56 days which means from that first day til the year ended she did not leave the property boundaries even once - quite unusual! She was estimated to be around 3 - 3.5 kg old when she arrived and so it was presumed she had just left her own mum and found her way here and intended to stay for sure. During 2016 he was identified on the property 54 times which tripled his time here from the previous year. 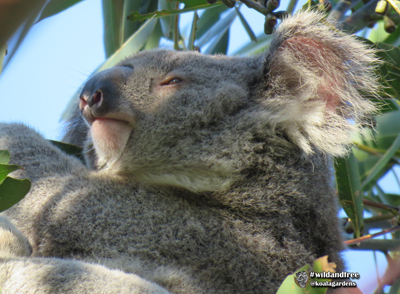 This means that while his home range extends far beyond the boundaries of the Koala Gardens property, his influence on the property was increasing. During the winter months he ventured further into areas of the property that he did not enter during 2015 so was possibly looking to expand his territory. is probably the very oldest colony member. At any rate we know that she was 10 -11 years in 2016 because she went for a trip to the vets and a stay at Friends of the Koala. Greta arrived on the property in May and we noticed that she had a problem with her right eye as it was 'wet'. 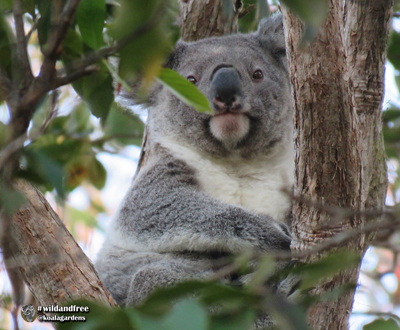 Of course it's hard to tell a lot sometimes by photo when the koala is 10 - 30 metres up a tree, so we kept an eye on her and looked for an opportunity to capture her. Finally at the end of July we had success and she spent 5 weeks in care. 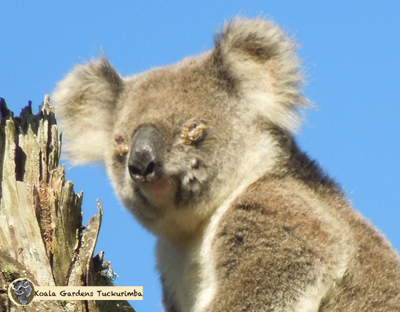 When we see a 'wet' eye on a koala we think chlamydia as this is the usual cause, but Greta had no sign of the disease. Her problem was a mechanical issue with her tear duct and it became obvious that she would have a 'wet' eye for the rest of her life. She was released in September, and even with the hiccup of her stay in care she was seen here on the property 51 times. is an alpha male and while he rules over a large section of the property he was here less during 2016, being sighted only 47 times. Something I have discovered however with Jordan is that he moves a lot more than the other males, and at times I have seen him in the early morning but he is gone again in the afternoon. This means if I only check the property once in the day I am more likely to be able to miss Jordan, while most other koalas I see in the morning will still be there in the afternoon. Not always, but Jordan moves more often in any 24 hour period. I guess that is the price for being the one in charge - you have to work hard at staying there! 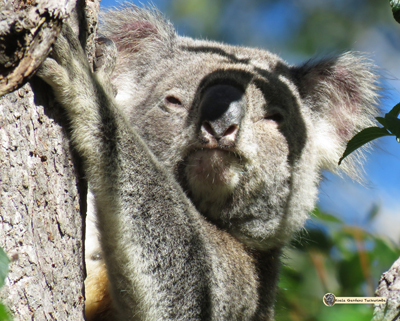 is a male that came to Koala Gardens in late 2015 with an obvious case of cystitis which causes the koala to become incontinent of urine and is a very serious disease that is often life threatening. You can see the dark colouring on his bottom from the constant dribbling of urine over time that has caused his bottom to be constantly wet and burning through to his skin. He was seen on the property a total of 17 days in January until he was caught and taken to a vet through Friends of the Koala. The chlamydia had progressed through his system and he was beyond help and had to be humanely euthanased. 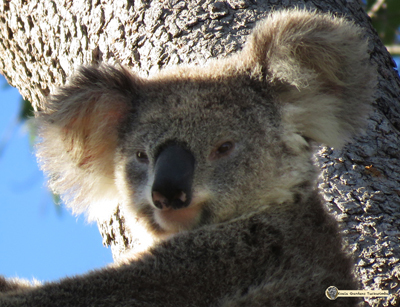 is a beautiful male koala that came through the property during 4 months from May to August for a total of 17 days. This means it is very likely that he is a male that is looking for territory to call his own and become his own home range. Most of the time we don't know what happens to these males that move through the corridor that this property is in, but Cyrano was seen just one day in 2017 so it would seem that he has settled somewhere in the area. 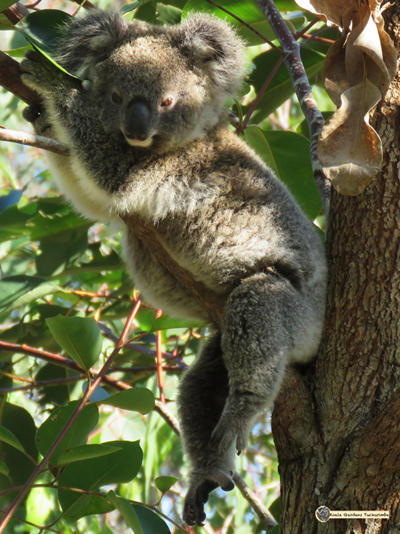 is a lovely young female koala that arrived on the property during November as a sub adult, probably weighing around 3 kg. She was only here twice during November and must have been looking around the area in general to find the right place to settle. She then came back more often during December and certainly settled in here during 2017. In 2016 she was sighted here 12 times. She has the biggest ears against her head size of any koala on the property making here extra easy to identify - her ears have become one of her most endearing characteristics by her many fans on Facebook. is a young female that arrived on the property during December and was sighted here a total of 5 days. However she settled right in and has become an important part of the property. She got her name from this first photo of her on the property as she looked a bit like she was about to go for a wild ride. 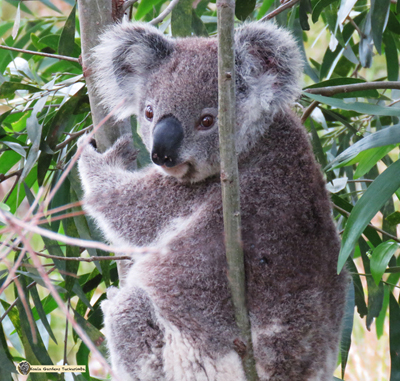 is a delightful young male koala that came through just for 4 days as he traversed the koala corridor looking for his own home range. We hope he found a great place to settle as he is a superb example of a male sub adult. is a young male who arrived on the property the same day that Helix arrived. He was only seen on the property 3 times so we hope he found a good place to settle and thrive. 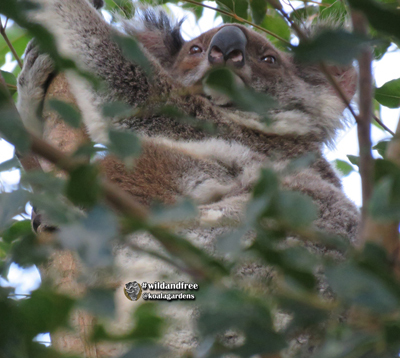 is a young female who was called in to Friends of the Koala by a member of the public about 500 metres up the road from Koala Gardens. She was found to have a joey in pouch and was kept in care for observation for a month or so. 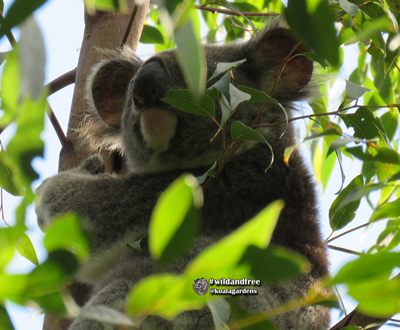 She was brought to Koala Gardens to be released and stayed 2 days eating well and getting her bearings. We presume that she found her way back to her home range that will be quite close by and hopefully raised her joey well. 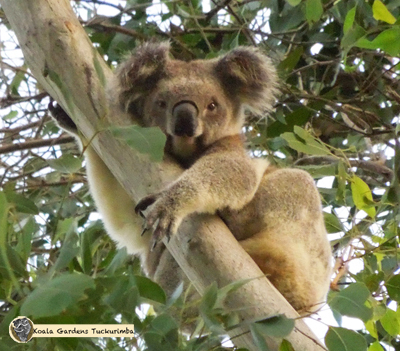 is a young koala that was seen just one day on the property, as she must have been moving through looking for a place to settle. 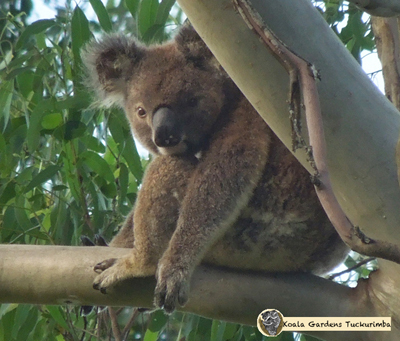 is a young male koala who appeared on the property on December 31, the very last day of the year, and hasn't been seen since. He must have been looking for a place to settle as a new home range. 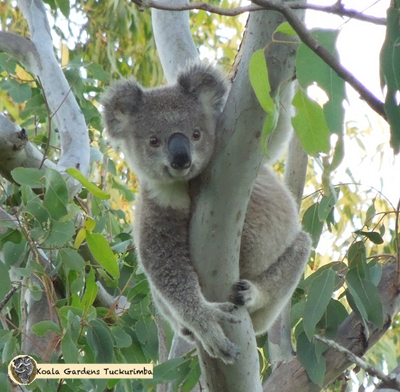 is a young male koala that was only seen on the property one day as he was moving through looking for a place to call his own. 2015 was the first full year of data collection. Daily spotting started in November 2014, but for ease of reference data is only referenced from January 2015 so that complete years of data can be compared. 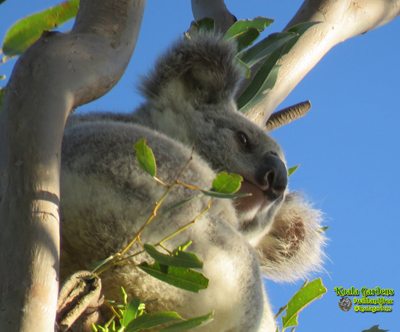 The final figures for 2015 saw koalas sighted on the property a total of 228 days. Over those days there were a total of 408 adult sightings and there were back young sighted 29 times. 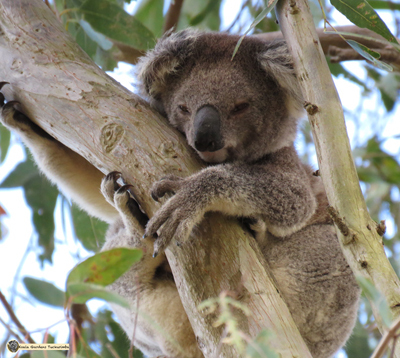 These sightings were the result of activity on the property by 18 individual adult koalas and 5 individual back young. an alpha male who ruled over 25% of the property. 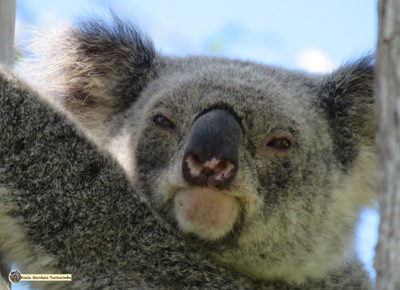 Clinger was a mature alpha when he was first identified in December 2014, and was the first koala definitely identified using nose pattern recognition. He had such an easily recognised nose pattern too, making him a great starting point. He was an important part of the colony and would have been contributing genetically to several generations in the colony at the least. 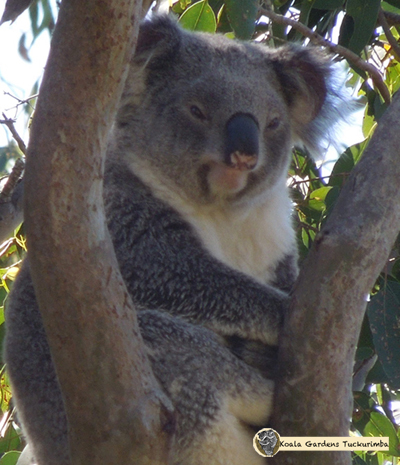 He was seen the highest number of times on the property out of all the koalas with 111 sightings, or roughly one day in every three. 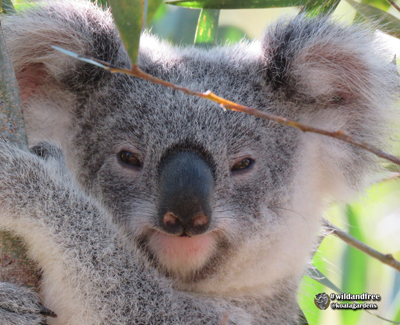 Clinger was widely popular on facebook, quickly becoming the 'face' of Koala Gardens. 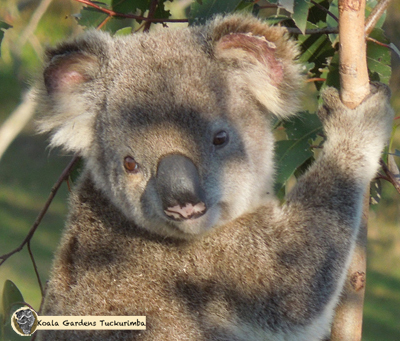 He was the first koala to begin to earnestly investigate the benefits of tasting the young trees in their early years, and the photos and video of him working his way through inspired Koala Gardens intense interest in koala behaviour, as Clinger seemed to be breaking a lot of 'rules'. He was last seen on the property looking healthy in November 2015, so we have no way of telling what may have happened to him. an alpha male who rules over 65% of the property. Each alpha male has his own home range which he will defend from other males competing for breeding rights. However, more than one alpha male will have home ranges within an entire colony area. This is why you can see 3 males here identified as 'alpha', but they each use their own home range areas while being considered part of the same colony. Jordan is a mature alpha but possibly had just come into maturity in 2015. 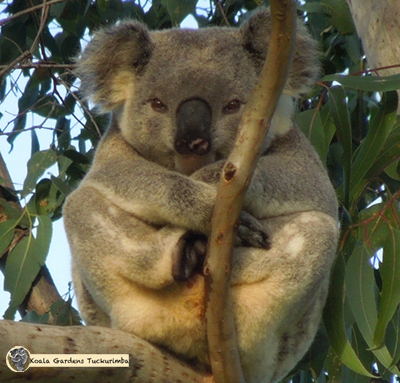 Male koalas are not fully mature until they are around 4 years old, but may begin to breed by 3 years old. Jordan has very dark fur and nearly full nose pigmentation. He was sighted on the property 67 times. 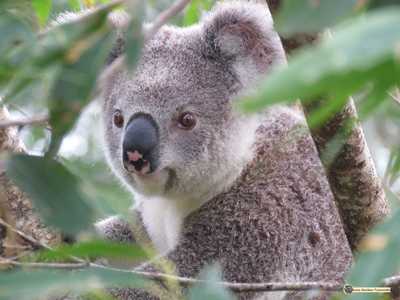 a huge female koala that produced a healthy joey during 2015. 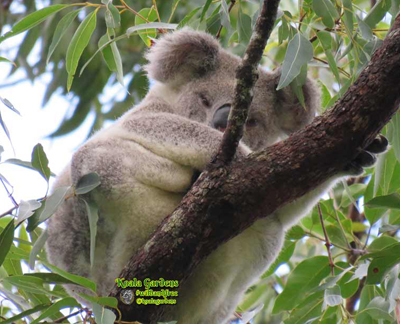 She was so named because she was "BIG Bertha" and that is a real compliment for a koala as holding body condition and weight is not easy on the calorie-poor diet they have, especially when habitat is fragmented. Bertha was sighted 39 times. Most of these sightings were while her joey was in her pouch and she left the property for a few months and returned with a lovely large and healthy joey. She has not been seen since this time so it is impossible to know what has become of her and any progeny. 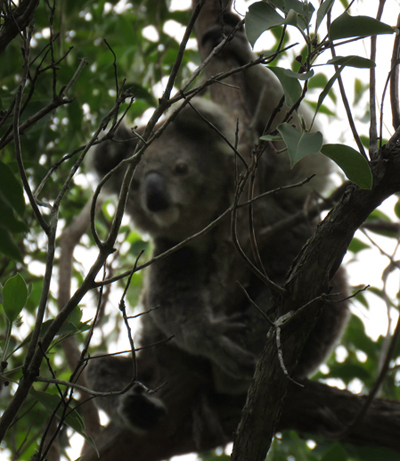 another large healthy female koala that arrived here with a joey in pouch around the same time as Bertha. Corky's joey was seen out of the pouch 5 times and was a healthy looking joey and she was settled as a mother. Corky was sighted 36 times during just a couple of months. 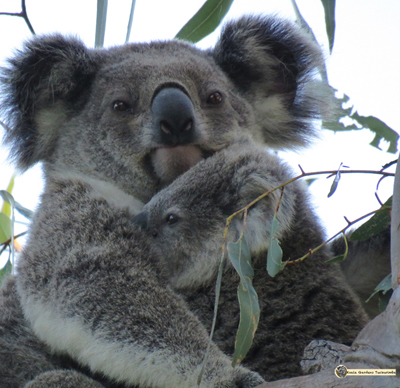 She left the property not long after joey emerged from the pouch. is known to be a matriarch of the colony and an important influence on the genetics and stability here. 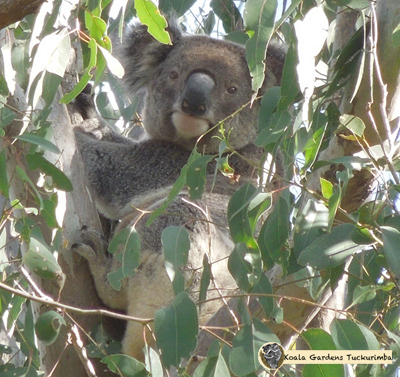 However it is interesting that even though she was one of the earliest koalas seen on the property as early as 2012 (even though she was not identified at the time she was photographed), she was not sighted on the property very often. In 2015 she was only sighted 30 times, so we know that she has a well established home range that touches this property but has important trees outside of these boundaries. 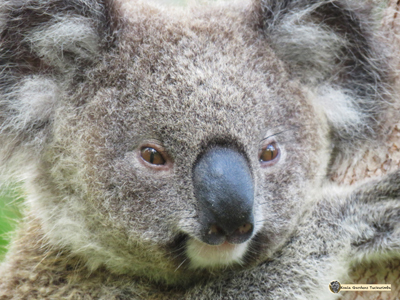 Mist produced a joey in 2015 which was healthy and she stayed around the property at the end of the time her joey was in pouch and the first weeks that joey emerged. She was then unsighted for 7 months until she returned. This made it very clear that data needs to be collected for a number of years (and 10 seemed to be a fair number to start) before any real patterns might be reliably identified. Zorro was a mature alpha when he was first identified in March 2015, so it can safely be presumed he was already breeding with females in the colony by this time. During 2015 he was only identified on the property 18 times between March and September. 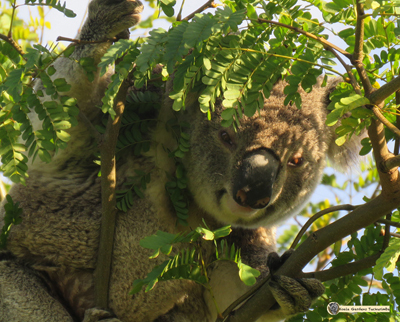 This means that while he is an important part of the colony, his home range extends far beyond the boundaries of the Koala Gardens property. 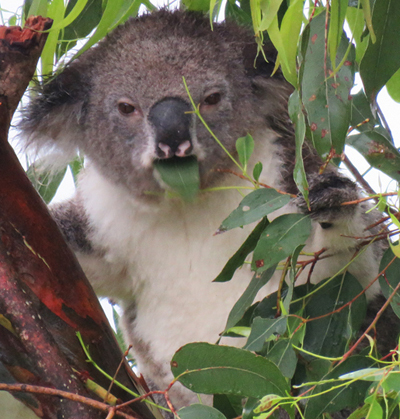 was the first koala on the property that was obviously infected by Chlamydia. From the first sighting it could be seen that there was a real problem with her eyes even though she was always high up in mature trees. When she was a little lower we could see that her bottom was discoloured as well. Even though she was only sighted 17 times, this was over a 6 week period and it was a stressful time of watching and waiting an opportunity to capture her so she could be checked by a veterinarian. Finally she was in a younger tree and a rescue team came out from Friends of the Koala and we were successful in capturing her. Tragically, not only was she completely blind, but the urinary and reproductive system involvement was extensive and she was beyond help of any treatments available and so she was humanely euthanased. was probably a young male looking to settle into a home range. He was sighted a total of 19 times between December 2014 and July 2015. Males have the hardest time securing a home range within a colony as they have to either take on a quiet life with no intention to breed (which certainly goes against nature in every way) or be able to establish themselves as an alpha which means either finding new habitat (which is a fantasy sadly) or fight for the right to take over an existing territory. So it would seem that Tootsie may have come through the property several times while moving up and down searching. There is no way to tell if he successfully settled himself into a home range. was a young male, probably around 2 years old. He would have been looking for a home range to establish and settle into. He was sighted a total of 16 times between March and July 2015. So it would seem that Dewy may have come through several times as he moved up and down the natural koala corridor searching. 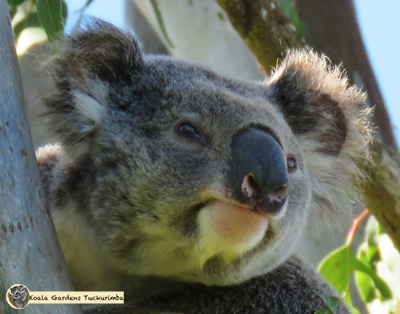 was probably a younger male (it is very hard to tell the age of a koala once they have achieved the basically mature size of around 6 - 7 kg without close examination). He was sighted on the property 13 times during February 2015 and then came back through and was seen once in April. was probably a young male, though he was a good size, that was looking to establish a home range. He was sighted on the property twice during May and then 10 times over 3 weeks during June/July 2015 and was not seen again. was a large, healthy appearing female. She was sighted here 8 times during August/September 2015 and has not been seen again. The reasons a mature female would be wandering a corridor seemingly in search of a new home are more complex as females are not so commonly displaced but it does happen. It could be as simple as important trees in her home range being cut down which is why people do not know what damage they are causing when they remove "just one or two trees". There is no way to tell if she successfully settled herself into a newhome range. was a huge, healthy mum with a well-grown large joey. She was sighted 6 days in a row in trees at the top of the gully, and then she was gone. It is very possible she was looking for a place to 'leave' her joey as her joey was about the right size to become independent. There is no way to tell what became of either of them. was probably a younger male that was looking to establish a home range. He was sighted 6 times on the property. Of these sightings the first was a single sighting January, and the 5 days during April 2015.
while Lofty was only sighted 4 times during 2015, these were the last 4 days of the year and his story is told above in 2016. He remains the worst case of cystitis caused by chlamydia infection that has been seen on the property. was a delightful huge female with regal bearing. She was only sighted 3 times on the property during September/October 2015 and so was obviously moving through. It was a little strange to see a mature female displaced and wandering, unless she had a home range very close by and was just checking a little outside her boundaries for better food. There is no way to tell, if she was doing this, or on the move to find a home range. was a full sized mature male koala. He was sighted on the property just 2 days during March 2015. He had a very dark colouring, much like the colouring of Jordan and Greta. He may have been a wandering male, with no determined home range, or he may have been a neighbouring male that was checking over the edges of his boundray. There is no way to tell if either of these, or other explanations, are the case. was a lovely mature female with a well grown joey. It is possible she was looking for a good place to 'leave' her joey as her joey was about the right size to become independent. She came to the property one day in May and was gone the following day.